Liu Qibao, head of the CPC Central Committee’s Publicity Department (R), and CASS President Wang Weiguang (L) attend the launching ceremony of the China-CEE Institute. 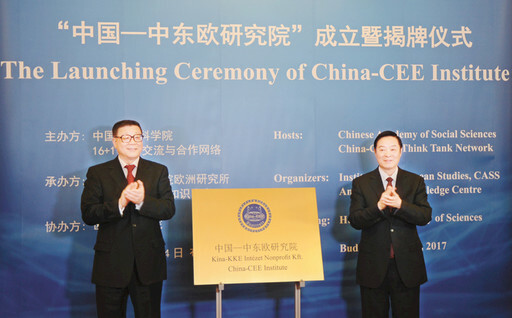 The China-CEE Institute was launched at the Hungarian Academy of Sciences in Budapest, capital of Hungary, on April 24. Liu Qibao, head of the CPC Central Committee’s Publicity Department, attended the launching ceremony co-hosted by CASS and the China-CEE Think Tank Network under CASS. The keynote speech was delivered by Wang Weiguang, president of CASS, chairman of the think tank network and honorary president of the newly established institute. Explaining the need for the institute, Wang said growing cooperation between China and CEE countries in all fields requires think tanks and academic institutions to broaden and further studies and exchanges on new situations and issues. This is an important step for the development of the China-CEE think tank network and also marks a new stage for people-to-people exchanges and academic communication, Wang added. More than 100 think tank representatives, government officials, businessmen and media professionals participated in the launching ceremony. The ceremony was followed by a symposium titled “China-CEE Cooperation: Joint Efforts to Address Common Challenges.” Experts and think tank scholars from China and CEE countries discussed the common challenges facing China-CEE cooperation and proposed solutions.